Lars Breneman is planning a vacation to visit his relatives in Germany next year and after reviewing his flight options he’s chosen to fly with Lufthansa. Lars’ decision wasn’t based on any loyalty to his German ancestry, rather he chose the German airline because he’s doing his best to save money – and reduce his carbon footprint. Lars, who lives in Seattle, discovered that Lufthansa has recently begun testing bio-fuels to help lower its carbon emissions, which also means the airline may eventually pay less towards the new EU carbon fees. For Lufthansa the objective is to become the “driver of change” in reducing GHG emissions with its new biofuels and has estimated a savings of 1,500 tons of CO2 emissions during the recent test period. On the other hand the US airline industry has taken a different approach having recently filed a lawsuit before the European Court of Justice. How Long Can the Airline Industry Avoid Being Part of the Solution? Despite loud protests from the airlines in the US, China and Canada, the issue really stems from the United States defiant position on what proper measures should be for reducing GHG emissions and the true impact of climate change. Since 2005, the EU has been obligated under the Kyoto Protocol to reduce emissions, whereas the US had opted out of the agreement. The fact is, 191 countries have signed and ratified the Kyoto Protocol, therefore all US industry involved in global trade may eventually be facing a future where GHG fees and penalties will have become standard practice. The First Carbon Neutral Airline in North America. 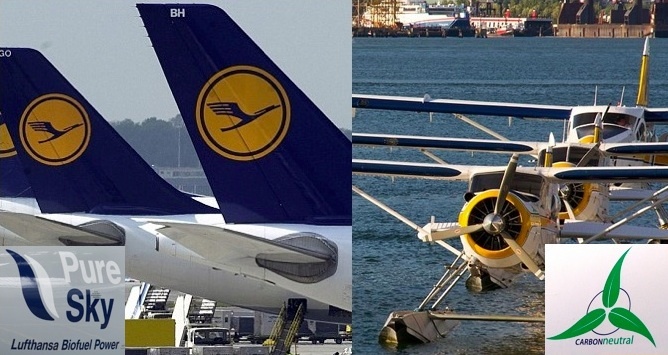 If only the North American airline industry had emulated the forward thinking approach that the world’s largest seaplane airline undertook starting in 2007. Harbour Air, based in Vancouver B.C., is today a fully carbon neutral airline. The 50-plane operation managed the feat by partnering with Offsetters, Canada’s leading provider of carbon-management solutions. According to Senior VP of Marketing, Kari Grist, “Offsetters goal is to educate, inspire and engage its clients.” The six-year-old company starts the process by gaining an understanding of their client’s business, then they find ways to reduce emissions across all areas of the business and finally, in the case of Harbour Air, they will provide certified carbon offsets that will in effect trade-off for the company’s CO2 emissions. Carbon offsetting is a system that allows businesses and governments to mitigate their carbon footprints by purchasing (third-party verified) credits from qualified sources that absorb carbon emissions. Qualified offsetting projects may also include land-use, renewable energy, (e.g. wind farms, biomass energy, hydroelectric dams) as well as industrial energy efficiency. Most importantly, the money invested in carbon offset projects will only qualify as certifiable carbon offset credits if they are real, permanent and quantifiable – and would not have occurred without the funding. Offsetters also works with organizations interested in conducting product product life cycle GHG inventory reports which assesses the product from “cradle to grave”. The analysis allows Offsetters clients to grasp their true carbon footprint throughout the supply chain beginning with the sourcing of raw materials to finding ways to streamline the production and manufacturing process. The next step is to improve and reduce packaging and simplify the distribution channel that leads to the consumer and then finally to the product end of life cycle phase where recycling, biodegradation and/or reuse options are then reviewed. Sharing Stories and Leading the Way. For Harbour Air, becoming carbon neutral has allowed the 29-year old company to share its story with customers wanting to reduce their carbon footprints. As a result, the airline has seen a 12% increase in passengers – even with a .50 fare increase to cover the offset costs. The airline is now the industry leader and has leveraged its brand equity by boldly “setting the environmental standard for aviation around the world” and by retaining a loyal and dedicated workforce. As reported in the Globe & Mail, the company has offset more than 41,351 metric tonnes of greenhouse gas emissions since Nov. 30, 2010. If the Olympics Can Achieve Carbon Neutrality – Anyone Can. “We strived to make sustainability part of everything we did as an organization,” said VANOC’s CEO John Furlong. “We did our very best to reach our sustainability goals whenever and wherever possible.” The Vancouver 2010 Olympics set the benchmark for the London 2012 Olympics and Sochi Olympics in 2014. The Price on Carbon is a Driver of Innovation. Just as Lars Breneman and many other consumers like him continue to make their purchase decisions based on cost, quality and now sustainability, all businesses will need to shift their mindset from the 20th century mode of linear thinking to the 21st century idea of a closed loop of sustainability. For the US airline industry the time to change is now. Categories: Branding , Environment , Marketing , Sustainability | Tags: Airline Industry, Bio-Fuels, Carbon Offsets, EU Carbon Fees, GHG, Green House Gas, Harbour Air, Kyoto Protocol, Lufthansa, Offsetters, sustainability | By: Edward Munro. The Next Level of Social Media and Communication – Periscope! Streaming TV is a Better Option – What can Advertisers do? Breaking Bad – Too Good for AMC?